In a time of great upheaval for the United States, it is hard to keep track of the many risks to our national landscapes. Even our nationally recognized and federally protected sites are under threat from privatization or lax oversight, making them vulnerable to destructive practices that place monetary gain over equitable enjoyment of parkland. Open Season on Open Space, this year’s Landslide program from the Cultural Landscape Foundation, minces no words on this subject, calling out municipalities, states, and the federal government for undermining a century’s worth of progress for our public lands, parks, and national monuments. The reclamation of urban parks for future development is a slippery slope. Appropriating parkland for a presidential library could be considered of exceptional merit. But once such land has been taken from Chicago’s Jackson Park, it could set a precedent for future development or change the criteria for what is considered exceptional and therefore worthy of erasing park space. Landslide considers the monetization of open space and weakening of park equity as the biggest threats to Jackson Park. These, along with detrimental effects of shadows, resource extraction, and the devaluation of cultural lifeways, make up Landslide’s five central themes. And it is the last two that loom greatest over the Antiquities Act of 1906, an act pivotal in the protection of federally owned lands now under siege by the country’s current administration. This December LAM is under (and around and in) water. The feature well is saturated with new ideas about designing with and through water. The Port of Baltimore is open to designing with its dredge materials and has green-lit a pilot project for Mahan Rykiel’s sustainable and social enhancement of the Chesapeake’s Hart-Miller Island. Along the lakeshore, Chicago’s Navy Pier is putting aside its tourist-magnet past, with a redesign by James Corner Field Operations that now attracts native Chicagoans and visitors alike. And a handful of local efforts aim to combat the persistent encroachment of sea-level rise in the vulnerable communities surrounding Hampton Roads, Virginia, one of the most important strategic sites in the United States. In Water, the EPA’s Campus RainWorks Challenge draws out creative solutions from landscape architecture students for treating and managing stormwater. Four landscape architects discuss the benefits and challenges of working in multidisciplinary firms in Office. In Materials, a quirky relic of an industrial past gets a glittery makeover for a Seattle park. And this year’s Landslide campaign from the Cultural Landscape Foundation calls attention to public landscapes and national monuments in immediate danger of erasure. All this plus our regular Books, Now, and Goods columns. The full table of contents for December can be found here. 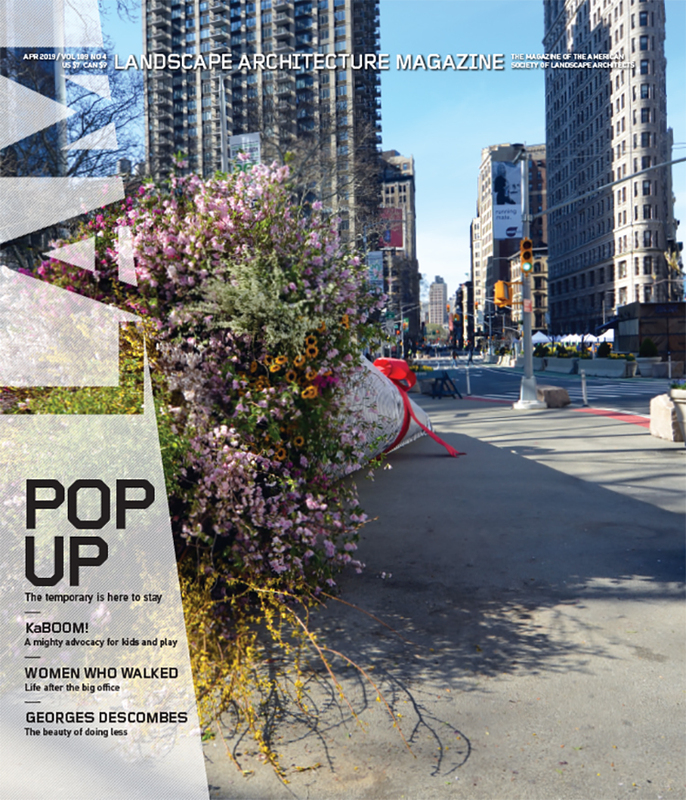 The 272-page November issue of Landscape Architecture Magazine is the biggest of the year, if not the past five. Why the extra muscle? Perhaps abundance is in the air: This year’s ASLA Annual Meeting and EXPO in Denver is looking to be one of our biggest ever. This year, the ASLA Award of Excellence in General Design went to Gustafson Guthrie Nichol for the Bill and Melinda Gates Foundation headquarters in Seattle. Despite the difficulties the central Seattle site provides, the site’s landscape design echoes its past as a bog, and its present as a centrifuge of global and local ethics. In “Fire, Rain, Beetles, and Us,” Carol Becker looks at the interconnected catastrophes recently visited on the Front Range of the Rocky Mountains. “Fluid Boundaries” finds the Colorado River reflow (“A Spring Flush on the Colorado,” April 24, 2014) is just one of several transnational projects to kick-start the riparian wetland along the Colorado River. Jayson DeGeeter, ASLA, talks to Guy Sternberg, the oak guru, about the species and his calling at Starhill Forest Arboreteum. “Detroit from the Ground Up” finds that landscape architecture is playing a major role in Detroit’s revitalization. And the photographer Alex MacLean and the journalist Daniel Grossman investigate the beginning and the end of the transborder tar sands oil trade. Departments deliver this month as well: NOW has Editor Brad McKee’s perspective on the Rosa Barba Prize, updates on Changing Course, and elementary ag in NYC; Interview talks to Reid Fellenbaum, winner of the ASLA 2014 Student Award of Excellence in Analysis and Planning about his spooky-brilliant project, “Meridian of Fertility”; House Call features residential design in Arcadia National Park by Matthew Cunningham Landscape Architecture; and the Back has a portfolio of The Cultural Landscape Foundation‘s annual Landslide campaign, this year directed at saving site-specific artworks. All this and the usual rich offerings in Species, Goods, and Books. The full table of contents for November can be read here. Credits: Gates Foundation, Tim Hursley; Pine Beetle, Paul Milner; Hunters Hole, Fred Phillips, ASLA; Guy Sternberg, Noppadol Paothong; Detroit, Detroit Future City; Alberta Refinery, Alex MacLean; Arturo Toscanini School, WORKac; Microtopographic Section Model, Reid Fellenbaum, Student Affiliate ASLA; Opus 40, © Thomas Hahn, 2014, Courtesy The Cultural Landscape Foundation.